Traditional, crayon-scribbled letters to the jolly elf at the North Pole have now met the 21st century. Using a Santa Letter template will help you melt the jolly old elf’s heart and encourage him to overlook any mistakes you may have made over the past year. It is also a great way to organize your thoughts prior to asking for the ever important wish list. Every present tucked under the tree or into the stockings with care begins with the formally written letter to Santa Claus at the North Pole. A free Santa Letter template is available for download on this page. This easy-to-use, customizable letter allows you or your child to write greetings to Santa Claus, reassure him about good behavior, apologize for being on the naughty list and of course, ask for gifts. By using this template to structure the letter your child can learn how to properly organize a written request, a skill they may need in the years ahead. Start with a greeting. Santa receives thousands of letters every year. They really increase in volume in December, as kids wonder if they made it onto the good list or the naughty list. So be polite right away and start by asking him how he and Mrs. Claus are doing, how Rudolph is being treated by the other reindeer, etc. If you know you have done something wrong, be honest. Remember, Santa Claus knows when you are sleeping, and he knows when you are awake but he is also a goodhearted person who knows nobody can be perfect all the time. So apologize and promise to do better in the future. Cite some examples of good behavior. Had you been kind to a friend? Taken good care of your pet? Shared with your siblings? Again, Santa Claus looks after many children, you want to remind him exactly what good things you have done throughout the year. Create your wish list. Remember, not everyone can get everything that they want, so put down the things you really would like to have in the upcoming year and be grateful for what you have. 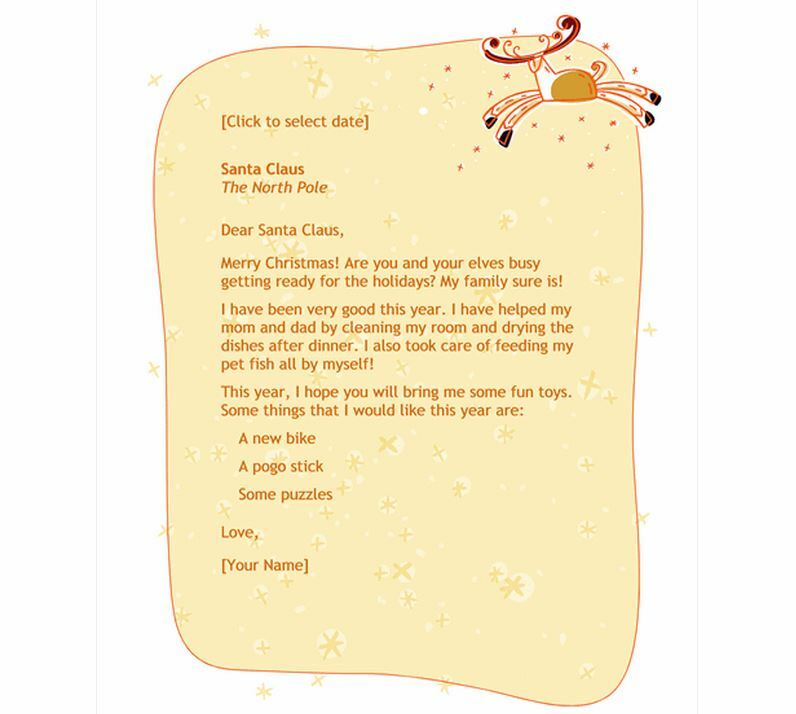 With a Santa Letter template you can write a polite, straightforward letter to Santa Claus and request your presents with 21st century technology behind every word.